The Rural Growth Network (RGN) Pilot Initiative was set up in 2012 with £12.5m from the Department for Environment, Food and Rural Affairs (Defra) and £1.6m from Government Equalities Office (GEO). The RGN Pilot Initiative was established in response to barriers to rural economic growth identified in the Rural Economy Growth Review. It sought to encourage growth in the rural economy; and to generate and disseminate lessons around what works in this context. The fundamental thesis underpinning RGN was that a network of “enterprise hubs” (each providing a locally-appropriate mix of premises, infrastructure and business support, and some kind of local network) could provide a basis for economic growth. After a bidding process, five successful local partnerships (“Pilots”) developed local RGN programmes to effect rural economic growth. The five Pilots were in Cumbria; Heart of the South West; North East; Swindon and Wiltshire; and Warwickshire. All pilots started delivery from early 2013 until end March 2016, over 60 different projects were delivered through these five Pilot-level programmes and around 9,000 end beneficiaries were supported. 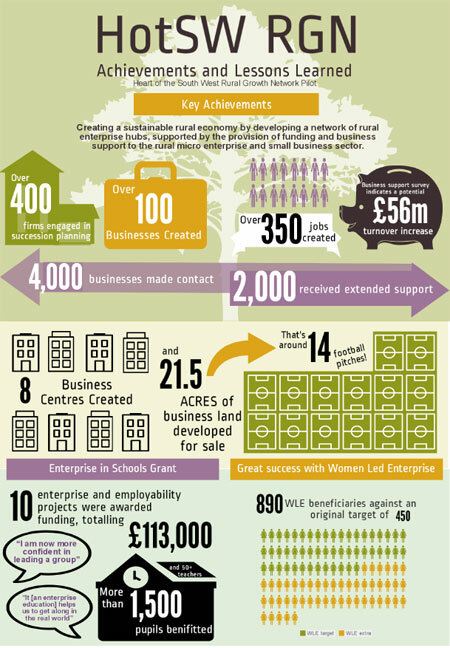 In the HOTSW area, approx £2.9M of grant funding was secured for the pilot, with an additional allocation of up to £1M for capital grants to micro enterprise in rural areas. In total, this grant funding enabled a programme to be delivered with a total cost of £24M, once additional match funding was taken into account. View the full infographic by clicking on the image below.